I think I can tie this post to Memorial Day. 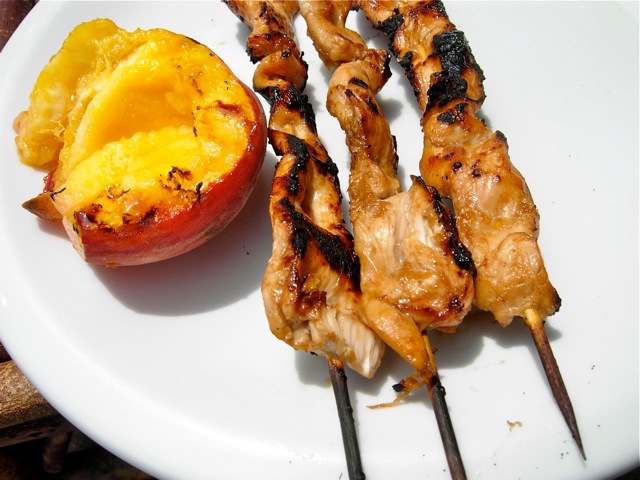 Today we grilled chicken teriyaki skewers and peach halves. The flavor of the teriyaki sauce yanked me immediately back to Hawaii, where I used to buy teriyaki sticks for a quarter whenever the Navy guys were grilling on the beach for a party or something. "Dad, can I have another one?" Loved that stuff, even though it was always overcooked and rather skimpy. Today we made some teriyaki sauce ourselves and marinated chicken breast strips in it. Then we threaded the meat on skewers and grilled them, to uproarious, insane, happy-dance success. Tender! Is that possible? And the grilled peaches. Peaches don't taste like this! Just slightly singed and warmed, juicy and insane. I gotta get another bag of mesquite. Tasted like pure Hawaii. Every school day we would pass right by the sunken USS Arizona, which was felled right next to Ford Island. It was just there, and we all knew it. We even knew people who knew people who had survived. Or died. But it was not a monument then. It was a sunken navy ship. I would think about the skeletons still down there. I was pretty young, so I wasn't having patriotic thoughts, but I sure knew it was there. Now it's a Memorial, all architected up. Fine. Good. But there was another sunken ship, right off my shore of the island, outside my front door. The USS Utah. Never heard of it, huh? It has a memorial, too, but it's not all splashy-fancy. There was also the USS Oklahoma, on the other side of the island. Battleship Row. I didn't pay too much attention to it because it was on... hah... the other side of the island. Whatever. I was pretty young. But I sure knew those ships were there and that men had died on them. Teriyaki! Who knew it could be such a Madeline biscuit for you. I have been thinking about your nephew, and how wrong so many things are on so many levels. For instance, your nephew, whom I did not know, remains one of the few people I know who have died in the I-know-someone-who-knew-someone sense. Wrong, crazy, bad, and terribly unfair. But grilled peaches, magnifique. Happy dance all around, for all of them. Thanks, El. You are exactly right. Cranky used to work at the SF Chronicle, and after he left, he ran into a former colleague. Told him Zack had died in Afghanistan. And the colleague said, "Nobody knows anybody who died there!" Same as you. Makes me feel bad for all of them. Ohmahgah, the grilled peaches. Is it worth lighting the Smokey Joe every day? Maybe. When we lived in Pearl Harbor (Makalapa) during the Vietnam war, I used to take visitors out to the Arizona Memorial until finally I simply couldn't stand reading all those names of all those (very young) men any more. After that, I'd take the visitors to the boat and just wait for them on shore - too sad to go there once you are old enough have friends who died in battle. Ford Island is a good story. My woodshop teacher in Jr. High School used to tell us he was in Alaska and heard the planes fly over to the attack at Pearl Harbor. My Dad spent time in Africa and England. Memoris of War are not right but necessayr. Zoomie: Oh, RIP. I didn't know about friends of yours who died. Peace. Chilebrown: Your shop teacher was bullshitting you. The Japanese tora tora tora planes were launched from Japanese aircraft carriers off shore. They couldn't fly that far solo. ALL shop teachers are bullshitters; don't feel bad. I wish you were there to tell Mr. Shonfield, who was mising his index finger, that he never lived the story he told over and over. Girls were not allowed to take shop because of hormonal imbalances I guess? Chilebrown: Yes, girls could be real disruptive with our lip gloss and proper mechanical drawings. You guys hated us because you couldn't handle us. Have you char-grilled Mango yet Cookie? You must, you really must. Mouse: Do you have the world's best mangos in the world? I bet you do. We get a paltry selection here, and they taste like fish. In loved mangos in Hawaii. Grilled, wow, that would be good. I don't know about the best in the world but our mangos are pretty bloody good, they certainly don't taste like fish. How odd! When you visit, make it late summer, I'll stuff you with bbq-ed mango and trout! Growing up in San Diego when it was a small naval town makes me relate...hell...up unitl 6th grade the air raid warning still sounded every day at noon and my old grade school had a bomb shelter. We had "shelter" practice once a month til about 3rd grade. The nuns then didn't care if the war was over. Mouse: Yes, mangos and fish! It does sound good. Simply: I didn't know you grew up in San Diego. I spent some time there, myself. UCSD in the late 60s. My parents retired in Escondido until just last year (they're in Monterey now). We had bomb shelter drills on Ford Island, yech, stinky. Kids played (and peed) there all the rest of the time. Odd to read this with my coffee this morning, as I got out of bed thinking of living ON a base during WWII when my father was in the Navy. I was remembering how it felt to hear Taps every night and how all of us, even the dependents, kept to the military schedule and were in bed when the sound came through the night air. I always loved/hated it and still get chills when I head it played live. Kudzu: Yeah, and when you're a kid it's all somehow NORMAL. Unforgettable. Oh yeah -- the food thing. Peaches! The amped-up flavors of warm peaches are amazing. I especially like crisp roast duck with peaches. We used to go to a little Sag Harbor restaurant in the summers from our house in Amagansett just for the fab local duck and orchard peaches. Yumyumyum. Kudzu: I might never eat a cold peach again. It was that amazing. My next door neighbor has a peach tree, but she doesn't share much. I'll bribe her up with plums and pears. Didn't know your parental units had moved closer. Good excuse to enjoy Monterey, which I like even better than Carmel - more real. And charming Pacific Grove. Oh, Zoomie, you don't know the parental dynamics. There is no venturing off the compound unaccompanied. House arrest. We're planning a visit soon; guess we'll have to lay some ground rules. And we'll have the pup with us, so there are other constraints. Sigh. Not fun. Hungry: Thanks, schweets. F*** war, right?